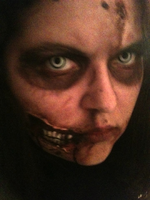 I am a self taught artist/ Special FX artist whose work tends to center around horror, fantasy and science fiction. I work mostly in traditional means (ie: Acrylics, watercolor and sculpture) but have also worked with digital art as well. I am also one of the Coordinators of the Tucson Zombie Walk. I have done make-up for a few student films and some small productions such as Cordial Dead, Copper Creek and Finley Wade. I am open for commissions. If you would like to help me out by commissioning me or buying my stuff, message or or click on the RedBubble link below. Cordial Dead: Click here This was a short film that I wrote and did a majority of Make-up for. Ted Finds Love:Click Here A short film with a zombie looking for love.